My mother is one of the world’s great food hoarders. Her freezer is always packed so full that when you open the freezer door things invariably tumble out: half a dozen New York bagels in a plastic bag, a Tupperware container of chicken stock, frozen leftovers, frozen packages of butter. The refrigerator is the same. Growing up, I did not realize that this was anything but normal. I’d look in friends’ refrigerators and think, “Where is the FOOD?” It should go without saying that this condition, if not hereditary, at least must create a strong genetic predisposition. I am always ready for the apocalypse; I reckon that I could feed myself and a small band of hardy survivors for at least a few months, although I do wonder what I’d do when I run out of cat food. You don’t achieve the condition of chronic food overstocking without some serious and sustained food over-purchasing. In London, I literally could not go to my nearby Turkish grocer without purchasing at least one bag of pulses in addition to whatever I’d set out to buy, would buy way too much meat EVERY TIME at Nathan Mill’s Butchery, and desperately loved my weekly outings to Tony Booth’s greengrocer, on Druid Street at the Maltby Street Market, where I’d fill a giant food carrier-bag with beautiful, reasonably-priced fresh fruit and veg. In Seattle, my nemeses are two: the wonderful bulk and wholesale food importer, Big John’s PFI, and Asian specialty supermarket Uwajimaya. (I don’t know why, but all those super-sized packages at Costco just make me scared and a little sad; I never have fun shopping there.) In addition to stocking an impressive collection of specialty ingredients, Uwajimaya has an excellent seafood counter. I always leave Uwajimaya ready to throw an impromptu dinner party (and sometimes do). The following simple marinade, made primarily from kitchen basics (purchased primarily from Uwajimaya), is wonderful for marinating seafood and grilled vegetables. 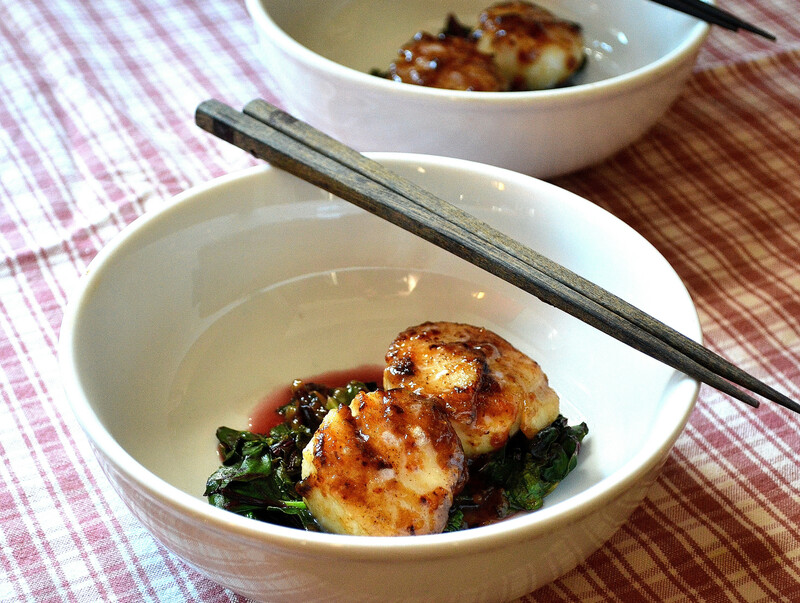 I wasn’t sure about blogging it, but I fed my sister some scallops using this as a glaze, and she (a) really loved them, and (b) demanded the recipe the next day, and used it to marinate halibut for her husband, who also really loved it. So, it is tasty, and it is sister- and brother-in-law endorsed. Combine all ingredients in a large bowl, and let stand for about 15 minutes before tasting and adjusting seasonings if necessary. Makes a little less than two cups of marinade. Marinate Asian aubergines, zucchini, squash, peppers, or sweet onions, sliced lengthwise, for at least two and up to four hours before grilling over low heat or slow-roasting until vegetables are tender and sauce has caramelized. Serve as a side dish, topped with a few sprigs of fresh coriander (cilantro). Marinate fish fillets or steaks (e.g., salmon, halibut, tuna, black cod) for at least four hours and up to overnight. If grilling, cook in foil on a low grill to prevent sticking; otherwise, broil for eight to twelve minutes (depending on the thickness of your fish and your desired doneness), or until sauce has caramelized. Preheat oven to 375 degrees Fahrenheit (190 degrees Celsius). Season scallops on either side with salt and pepper. Melt a knob of butter (use oil, if you prefer, although I like the caramelization that happens with butter) in a heavy-bottomed, oven-proof pan over medium-high heat until foamy. Brown the scallops (about two to three minutes), turning once. Immediately after flipping the scallops, spoon about a tablespoon of miso glaze on each scallop and cook until the glaze starts to bubble and thicken, about two minutes. 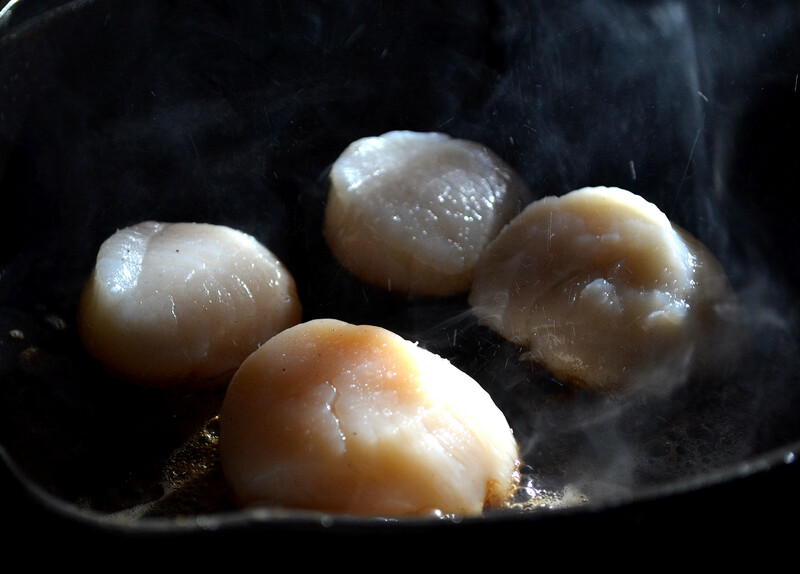 Transfer the pan to the oven and cook for a further three to four minutes, depending on the size of your scallops. If you like, stick the scallops under a low broiler for a minute or two to caramelize the glaze on the surface. I served these as a starter on a bed of wilted mustard and beet greens from my CSA. This entry was posted in Condiments, Marinades, and Sauces, Recipes and tagged Asian, Easy, Fish, Ginger, Miso, Photography, Quick, seafood, Soy, vegan, vegetarian by Susan. Bookmark the permalink. We are kindred spirits. I find few things in the world more depressing than Costco (well, ok, maybe Sam’s which is basically the same thing but without the halfway decent politics, and I admit I do frequent Costco’s wine store). And, for sure, we will live for at least a while come the apocalypse. That is, if the cats or chickens don’t eat us first. 🙂 And, goodness knows, I do love anything steeped in miso! Those superstores are sooo depressing. Come the apocalypse, I’ll commandeer a tractor and come in a convoy to Kentucky. I’m confident in your feeding and Steve’s foraging abilities. They are depressing! But I do have to admit that whenever I visit my parents, I ask to go so I can stock up on food service containers, white cotton tub mats, toothpaste, ibuprofen, and inkjet print cartridges. If I could bring home toilet paper, i would probably stock up on that too. This sounds right up my street, I can taste it! It is Milli food! Super umami! I think scallops are possibly my favourite food (although my opinion seems to change daily on that), and this glaze really does sound perfect for them. The veggies sound pretty good too! (I went to Costco once, and luckily have never found it necessary to return).